Two films, one from the French master of suspense, Henri-Georges Clouzot and the other from an American legend at the height of the auteur-led 70's, William Friedkin. Both great films and both from the same source material. We explore the creation-with spoilers! But the way they approach the material is different. Henri-Georges Clouzot's Wages of Fear (1953) is character orientated and takes it’s time in establishing our protagonists, portrayed by Yves Montand and Charles Vanel amongst others. There's also a deep political angle to the piece, with the distribution of wealth around its dusty South American village clear to see. It's nearly an hour before we hit the road, but when we do it's all the better for knowing – or in some cases, expecting – how our protagonists might react under any pressure, particularly the characters of Jo (Vanel) and Luigi (Folco Lulli). The pressure itself comes in perhaps the most sustained pieces of tension in cinema history. 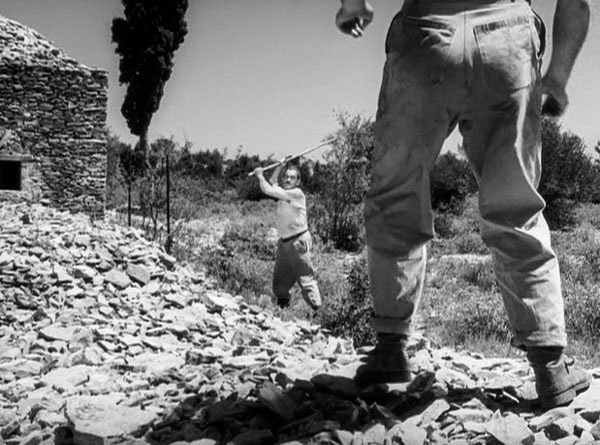 Clouzot rings every ounce he can get out of the scenario, placing realistic obstacles in the paths of the characters – to name but a few of the iconic action sequences that he stages in the film: The reversing of the trucks over a damaged wooden bridge, the massive boulder that requires some smart thinking to remove and most memorably, the oil pit that almost sinks the whole endeavour – but the smarter decisions are made in exposing the weaknesses of these men in the first third. Sure, the ever present threat of being blown up is dangerous, but the real threat to these men lies inside their own minds. The memorable final sequence in the picture is the darkest of dark jokes, but completely within character as the cocky victory is snatched away. The merry dance that see's Montand's distracted Mario to drive his truck over a cliff and to his demise may have been one ironic moment too many for a mainstream audience. A pessimistic picture to its final frames, and one that the mainstream Hollywood studio pictures of the time may not have dared to approach. Still from Clouzot's THE WAGES OF FEAR. 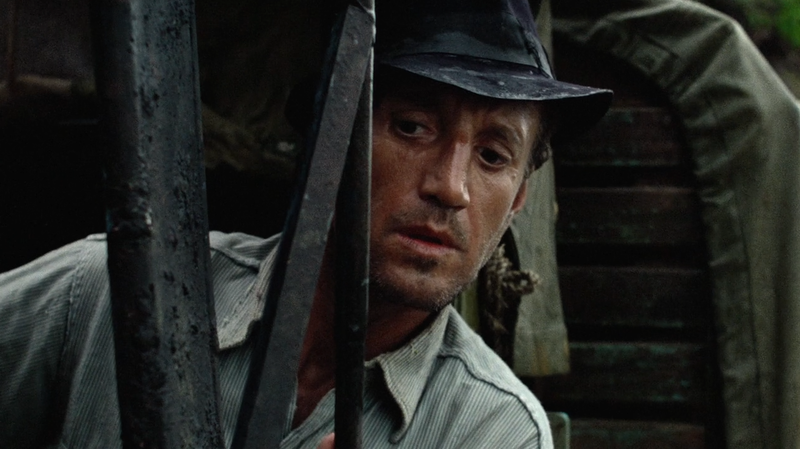 With William Friedkin's 1977 adaptation of the same material, titled Sorcerer – he's often referred to it as not being a remake, more an alternative version – there's a primal element to it – Hallucinogenic passages that get to the core of the insanity of even trying to deliver the package. It's more ferocious, in a literal, elemental way as Friedkin substitutes the desert passages of The Wages of Fear for jungle locations, whilst maintaining the original structure. It's not as tense, but definitely works as a piece in its own right. Its opening moments, where it gives each of the four men motivation for being in trouble are very different from Clouzot, who gives us exposition to the earlier escapades of the protagonists. Both, interestingly, eschew much in the way of a female presence in the films. Indeed, Friedkin's original choice for the lead role taken by Roy Scheider was Steve McQueen. McQueen wanted to do the picture but insisted on his new bride Ali MacGraw being in the film too, and wanted a re-write to add a female role. Friedkin refused and when McQueen countered with offering MacGraw an executive producer credit, he moved on to other options. In a semi-ironic hint at the past, Clouzot cast his own wife Véra Clouzot as Montand's love interest in the 1953 adaptation. In its own way, Sorcerer is as much a reactionary piece as Francis Ford-Coppola's Apocalypse Now. The jungle setting and the unpredictability of a fight that its characters do not expect to win has its roots in the Vietnam War and Nixon's White House. The kind of film that came at the pre-Star Wars (1977) zenith of filmmakers being given high-budgets to make dream projects. With its substitution of some of the original action set pieces for different locations and slightly altered challenges – one particular breath-taking sequence sees a decrepit bridge over a fast-moving river almost take out one of the trucks, and a third act that descends into a internal heart of darkness for Scheider, it's a very different adaptation but a very worthwhile one. The great electronic score by Tangerine Dream places it firmly within the 1970's and Scheider gives one of his very best performances. Unlike Clouzot's version, Sorcerer wasn't a massive success at the North American box office. It had the unfortunate timing of opening opposite the aforementioned Star Wars, which changed how Hollywood made and marketed movies. Spielberg's Jaws (1975) had opened the door for it, but now George Lucas had kicked through and changed the landscape. Sorcerer found its cinematic life limited and all but vanished within a couple of weeks. Time has been kind to it though, with many now ranking it up with Friedkin's previous masterpieces, The French Connection (1971) and The Exorcist (1973) – including the director himself who states that "It's the only film of mine I can actually watch." In historical terms, The Wages of Fear is regarded as a masterpiece with fans including Christopher Nolan, who programmed it as part of his BFI season leading up to the cinema release of Dunkirk (2017). Clouzot went from being virtually disowned by the French New-Wave directors of the 1960's and 1970's as being 'too classical' – a story in itself – to be regarded as the French equivalent of Alfred Hitchcock and a master of suspense in his own right. The film has an energy and plays just as well today, with many of its tropes being integrated into modern action and genre cinema. Sorcerer has resurfaced with a new restoration, with audiences around the world now able to obtain the film on a wider scale than it had been in decades, often with William Friedkin giving an introduction to its myriad joys. Sure, sometimes it's very hard to imagine why anybody would attempt to remake or reimagine an acknowledged classic, but every so often somebody tries to do something new and daring with the material – and every now and then they succeed.